Constitutional Day has been the primary event of the UM Consti Team every year. Coincidentally, the Federal Constitution marks its 60th year anniversary this year since its inauguration in 1957, following the achievement of independence of our country. Therefore, 2017 is nothing less than a meaningful year to celebrate this significant milestone of the Supreme Law of the land has accomplished, as the backbone of the entire country. 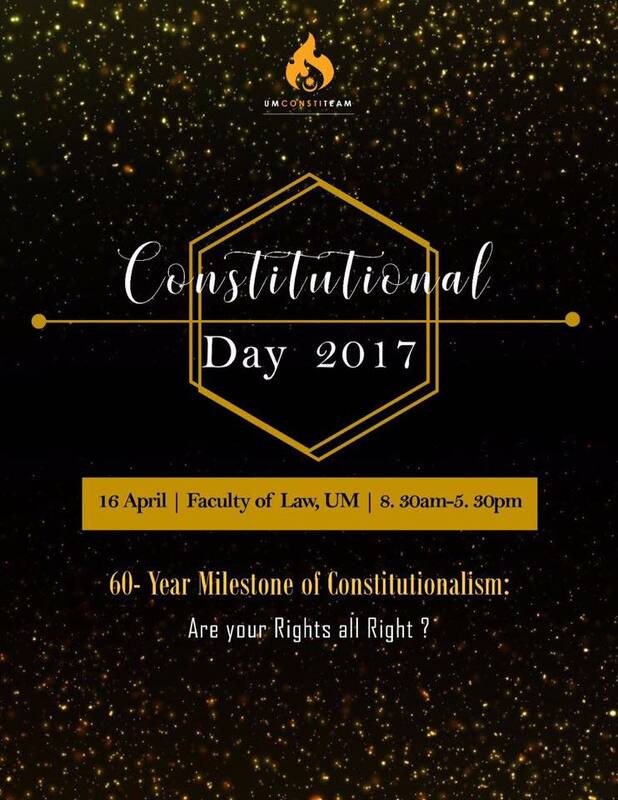 Hence, the theme for UM Constitutional Day 2017 is 60 Year Milestone of Constitutionalism: Are Your Rights all Right? In accordance to this theme, there will be an array of activities, brought to you by the UMConsti Team in collaboration with other organizations, such as MyConsti. This includes workshop, booth exhibition, pocket activity and academic discussion. Besides, a forum on the topic of Balance between Freedom and Limitation: Is Your Right to Free Speech Unfettered will be held with prominent speakers such as Prof. Datuk Dr Shad Saleem Faruqi, Azmi Sharom and Syahredzan bin Johan. Venue: Faculty of Law, University of Malaya. This event has been recognised and approved by the Jabatan Pendidikan Wilayah Persekutuan Kuala Lumpur, thus secondary school students are encouraged to join this event as well. It is our aim to raise awareness and provide participants a new insight into our Federal Constitution. What are you waiting for? Join us now by registering yourself online here. Do follow our event facebook page for more updates.